Whew! I’m nearing the finish line of this Suduko Wardrobe Contest. These pants from Mimi G for Simplicity pattern 1019 is piece #5 of 10. This contest was a great way to challenge myself to make more pants as I always find myself leaning towards dresses. Black pants are a staple of any wardrobe for any season and slim pants pair well with almost everything; tanks, tees, tunics, dresses as tops, oversized sweaters…you name it! So it was a no-brainer that black pants would fit somewhere in my wardrobe. I originally wanted to sew up a quick pair of leggings (I was thinking Butterick 5788), but decided that a slim pant would be more versatile. Simplicity 1167 is a pants pattern I’ve been wanting to sew for a while now, but was a little to ambitious with the time constraints of this contest. I considered Vogue 1411 as I’ve owned this pattern for a while now, but when I pulled it out the pattern I remembered why I haven’t sewn it yet…the sizing. I don’t understand Sandra Betzina’s letter sizing, though admittedly I haven’t tried. 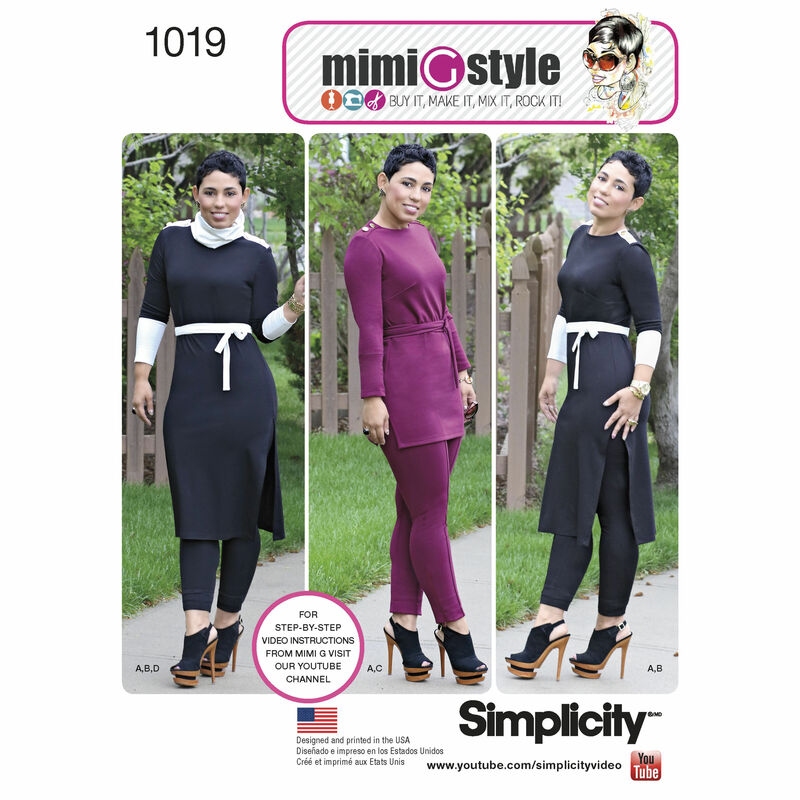 Ultimately decided on Simplicity 1019 because I’ve made them before (here) and my recent success with another Mimi G Simplicity pattern, S8093 that I used for my cropped wide legged pants didn’t hurt! I cut and sewed a size 16 which has a 39.5″ finished hip measurement (my hips measure 41.5″) which is the largest size in the smaller envelope. This was mainly because I had previously purchased this size, lol. If you want a knit pattern to be fitted you need negative ease and my ponte had enough stretch and “snap-backness” that I knew it would stretch 2″ with no problem. I did do a BBA (big booty adjustment) by adding 3/4″ to the back crotch. This is a modification I typically do (though usually more like 1-1.5″) but need less with Mimi patterns. She helps us curvy girls out! I didn’t really follow the instructions because I’ve made these before and they are pretty simple. 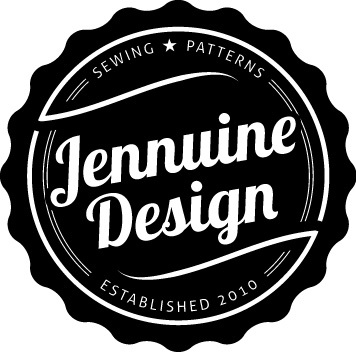 Just like all Mimi G patterns, this pattern has a free video sew along on youtube if you need a little help. I started by sewing the front pintuck and back darts and constructing the back pockets. I sewed and serged the inner leg together before attaching the back pockets. I needed to test the fit so I basted the pants together at the crotch and outer leg to test the fit. After trying on the pants, I decided to take in about 1/2″ or so from the front and back center seams, starting from the waistline and grading back out to the stitch line about 3-4″ down. I then went over my stitches with a regular stitch. Next up were the zippers. The pattern calls for two 7″ zippers (for the leg zips) and one 7″ zipper (for the closure). I debated using invisible zippers for the legs because I like the pulls on the coats and Clarks invisible zippers better than the regular zippers. However when I searched my stash I already had two 7-8″ black zipper in my stash so I used those. I had to go out an by an invisible zip for the waistband. I found sewing in the zipper in the leg a bit tricky because the leg was already sewn and it was hard to fit it under the machine. As a result I stopped short of the marking for the zipper opening. It’s quite possible that I did something wrong. I don’t mind though the effect it the same even though my zipper may only open 5-6 inches instead of the seven intended. Overall I love these pants! The fit is good with minimal adjustments and they are pretty simple. I do miss side pockets, but those could be added, though I’m certain they were not included because they would be bulky. This fabric, which I believe is a rayon/lycra ponte, is perfect for pants. It is a heavier weight ponte, that has good stretch and great “snap-back. The first time I made these pants I feel my ponte did not have enough recovery and they sort of grew with time. The verdict is still out here as I’ve only worn them once, but I feel that the rayon or viscose pontes have better recovery that the polyester ones. Pattern Description: Knit pintuck pant has side zip closure and zipper detail at the ankle. Fabric Used: Black ponte from either Fabric Mart or a local store. This viscose/nylon ponte would probably be great for these pants. Likes: Easy pants pattern, the pintuck in the front, the leg zippers, contoured waistband. Would I sew it again? Yes, these whipped up quickly and I love this style of pant. I need them in a few colors. Would I recommend it to others? Definitely. With no side seam or front pockets this pattern is easy to fit to your body which minimal hassle. Fantastic wardrobe staple! Pants fitting can be so difficult and you nailed it! It can be, other pants patterns I’ve tried have not turned out as well. Thank you. Very nice. They are very attractive on you. What a lovely outfit! The blues and black look fabulous together. I love cobalt blue and black, I pair the two often! Any good reads/videos on adjusting for curves? I’m a 32 waist and 44 hip so I’ve stayed away from pants for now. Hi Faneisha, I’m sorry I don’t. My waist is only 6-7″ smaller than my hips, so that is not a challenge I face. I would search YouTube or Google because I’m sure there is some great guidance available. As a guess I’d suggest you cut the pattern to fit your hips and then grade down to your waist by making adjustments for at the center front, center back and side seams. Darts will likely be your friend as well as knits like ponte. Maybe start with patterns that feature princess seams such as M6965. Also be sure to look for tips on how to adjust crotch length.